Had to order them - only black in stores. LOVE THEM. They are the perfect heel height for my life. Extremely comfy, and quite well made. A slam dunk for Seattle, Salt Lake City and Arnhem/Velp Autumn and Winters. Like them in Spring with white and blue too. 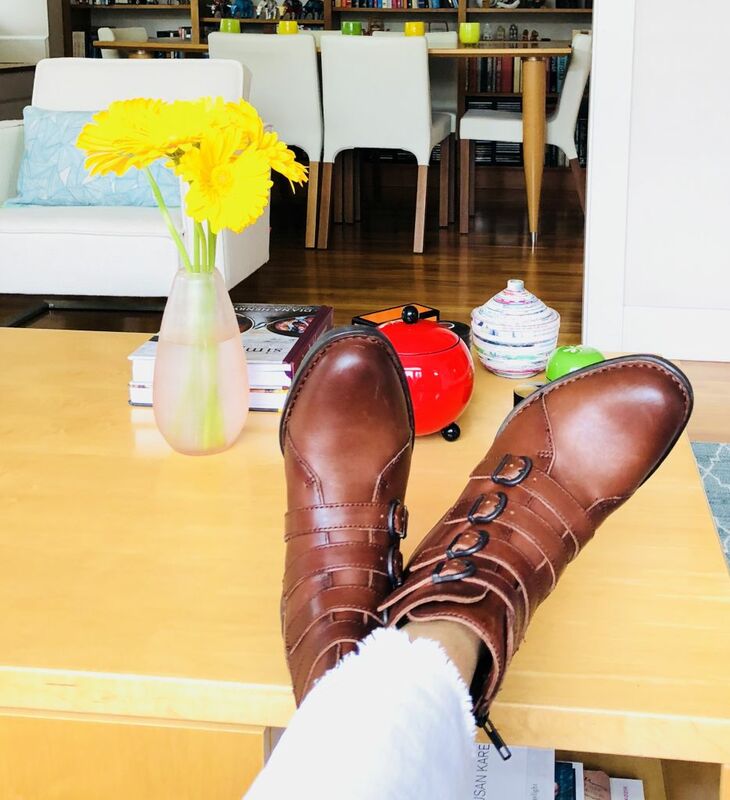 Don’t usually wear chunky boots with hardware and buckles - but these have a dainty toe, and low contrast buckled hardware. The brown is very rich. Ankle fit not too wide for my narrow lower legs. I’m running with it! Bonus: easy to polish when they get scuffed. Those are nice on you! I see that you are on a slightly newer shoe journey in that you are liking buckes and details on the shoes. The color is great for you too. Would you suggest ordering one size or a half size up with higher volume and wider foot? Also, are they more chocolate or cognac? They look both in your pictures! Thanks! JoyceB, thanks. YES. I am very carefully adding a buckle and a stud in the show dept. I now have a pair with each - that's enough, and a nice way to change it up. K2, the stock photo is accurate. CHOCOLATE. I have those coming to me (in black). I have a thicker ankle and lower leg so they may not work for me but it's always worth a try! I’ve been eyeing these in brown since I saw them in the catalog. Have currently held off, but you’re making it tough. This style is right up my alley, as there’s never been a grommet, buckle or rivet I didn’t like. This is such a different look for you, isn’t it? These look like they would be nice for a chilly day. I have some Born booties that are really comfy. I hope you enjoy wearing these. Bet these will not work for me as they fit your low volume feet so well. Still, beautiful boots! Wonderful, they look terrific on you! They are on their way to me as well to replace a higher heeled pair I can no longer wear. Here's hoping! 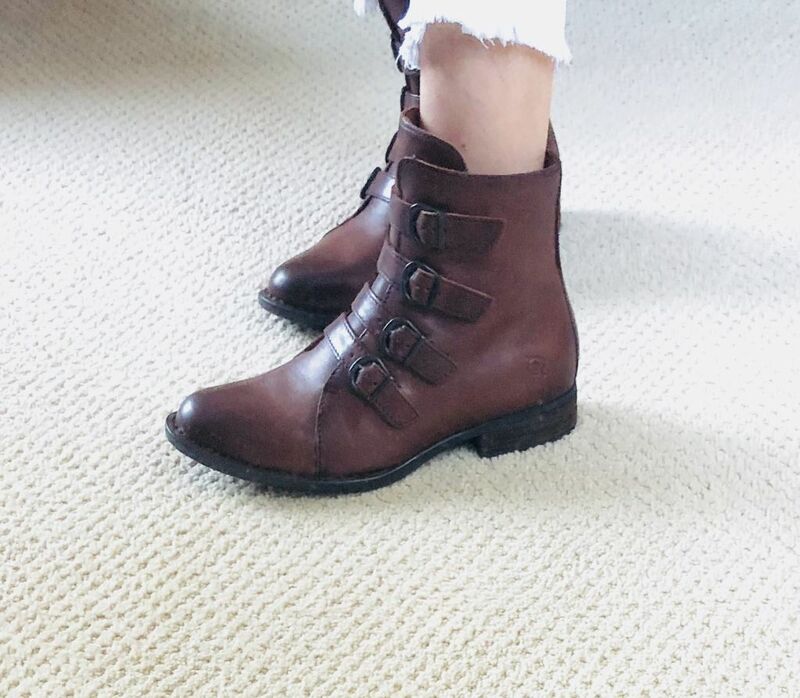 I love Born boots. I've had many pairs over the years and they've all been workhorses for my style. They look terrific on you! I tried them on last night at the store and I, too, ordered them in brown. My foot is very high volume and calves are not dainty and they fit beautifully! I went with my usual size. Funny how one shoe can fit a range of people sometimes. 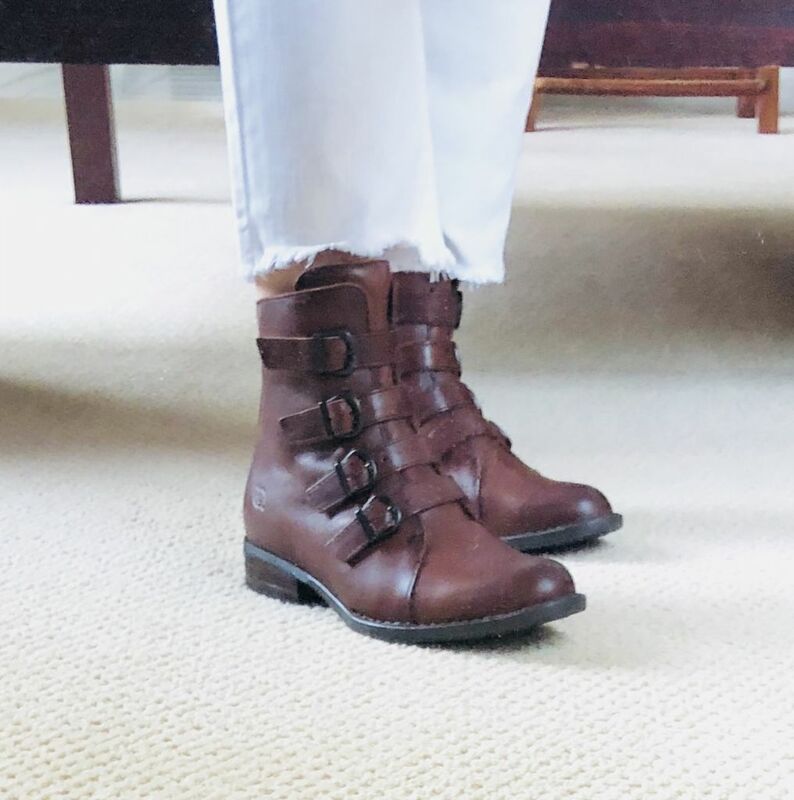 I just ordered them in black to compare the aquatalia buckle ankle boots which are super comfortable but the ankle is too wide for me (really turned me off). KnittingGene - good to know they worked for you. It gives me hope! I considered those in black but don’t think the silver buckles translate as well as the low- contrast metal on your brown ones. Ladies with High Volume Feet - TRY THEM A SIZE UP. They worked very well for my client who has extremely high insteps and arches, and wider ankles and calves. You can also adjust the straps a little. Thank you Knitting Gene, for the validation. Excellent info. These boots are VERY forgiving of foot shapes. I ordered these too, to replace a workhorse pair of low-heeled black booties. Unfortunately, these were way too wide for my feet. Sob. I had high hopes, because I have umpteen pairs of Born oxfords, and really like the brand's quality. Next. They look terrific on you Angie! These are fab on you, Angie! Love them with the white jeans. I didn't include these in my first round of footwear ordering. Think I'll fix that with my next order. So cool! I feel you are channeling my shoe style. I also admired this pair, but I was saved by the fact that they are quite similar to my beloved lace-up brown booties. Phew! Tempting! They look great on you. Haven't seen you in this type of buckle boots since the rugged Donald Pliner's (if memory serves) of years ago. I did like those on you a lot, too. This style tows the line between chunky and sleek perfectly. And the color is RICH. Love! I love these boots! They do seem different than your usual style but it’s fun to shake things up a little. Personally I love buckles and rivets. Love them with the cropped jeans. May need to give these a try. Such a rich color. I really like these boots. They look super Angie! NICE! These are definitely more RATE than your usual footwear. It’s nice to change things up a bit every once in a while!